The superfood shake recipe we share below is a great way to get all the super nutrition that you need in one delicious energizing drink. As a spiced herbal shake elixir, it is packed with layers of superfood goodness that may take a little prep work when making it first time around, but in the end will be well worth the effort spent. This recipe is particularly easy if you already have many of the ingredients stocked in your pantry of superfoods, super herbs and medicinal mushrooms. We personally use these foods everyday and purchase them in large quantities, most of which we have organized and labeled in glass mason jars. But even if you are new to many of these items, this may be a good opportunity to get to know a few of them and perhaps will be further inspired to incorporate these essentials into your diet on a regular basis. What is a Superfood Shake Elixir? The literal definition of the word "elixir" means a "magical or medicinal potion." This is basically what you are creating, an herbal brew mixed with high quality protein, fats and superfoods, combined together in the modern day cauldron called the high speed blender. 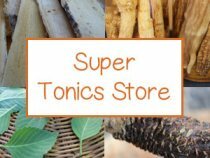 Many health enthusiasts these days are making superfood elixirs using tonic herbal teas as the liquid foundation for a variety of blended drinks. 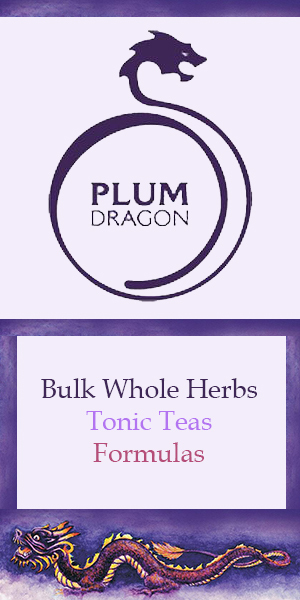 This is a wonderful way to integrate them into your diet, especially if you are not normally a tea drinker. 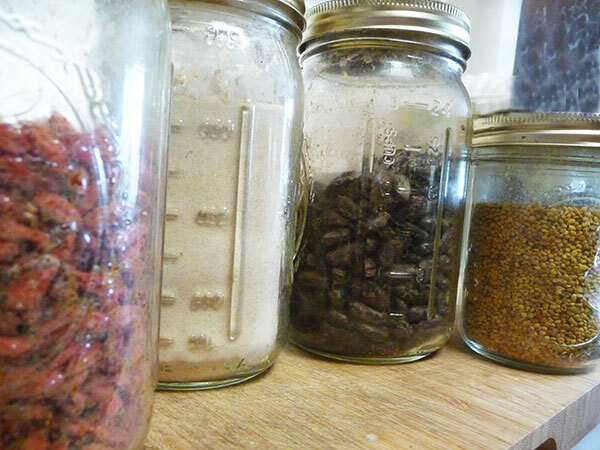 We use herbal teas as a base for blended smoothies, sauces and soups. They can even be added to any recipe whenever you require a liquid ingredient. Once you get into the habit of making your quarts of tea in advance they can be stored in the fridge ready for use when you need them. 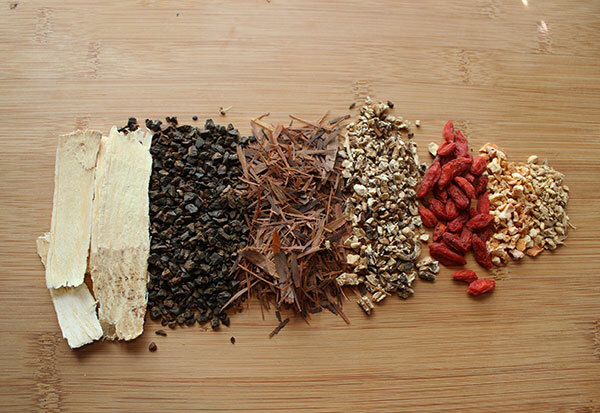 The herbal tea recipe we use in this superfood shake is a blend of tonics, using astragalus and fo-ti, as well as the two cleansing herbs, pau d'arco and dandelion root. Depending on your own personal health goals, you may wish to substitute some of these herbs for more appropriate ones relevant to your current needs. 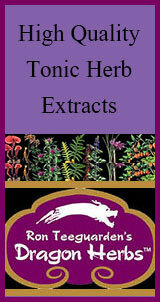 This could include any number of Chinese or Ayurvedic tonics as well as different cleansing herbs. For those adhering to a health promoting diet, blended foods are becoming the new "fast foods" for the contemporary lifestyle. 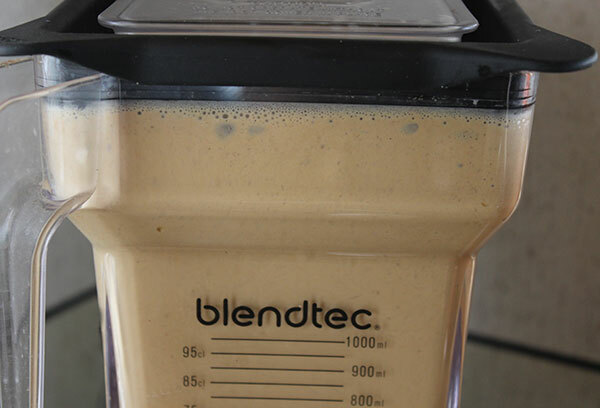 It is easy to throw everything into a blender mug and create delicious and nutritious meals that are easy to digest, assimilate and don't slow you down or make you feel tired. 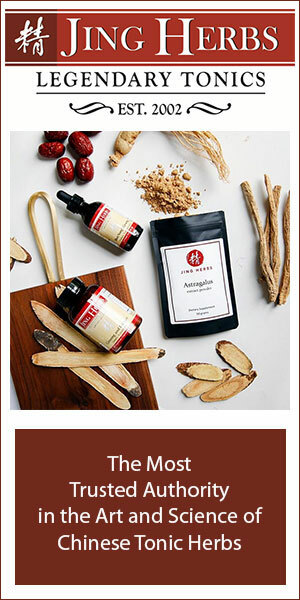 When you add highly revitalizing adaptogen teas and superfoods to the mix, you get all the additional nutritional benefits they offer, plus lots of health enhancing polysaccharides and antioxidants. 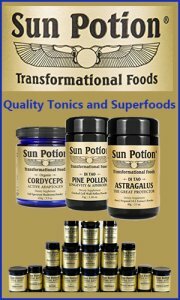 Many of these foods and herbs also work "synergistically" when combined together, increasing the medicinal qualities of these nutrients. Here is our beloved superfood shake recipe made from a base of herbal tea, spiced brazil nut milk and a number of top superfoods. 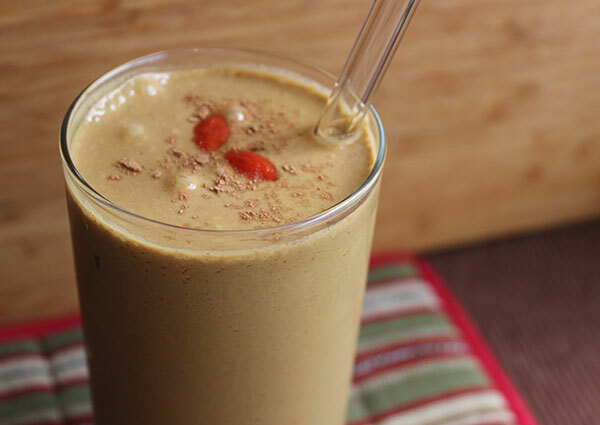 This shake recipe is not for beginners, but over time with a little practice, making fortifying and energy uplifting drinks like this one can become a natural part of your health regimen to be made in large batches and consumed over a several day period. 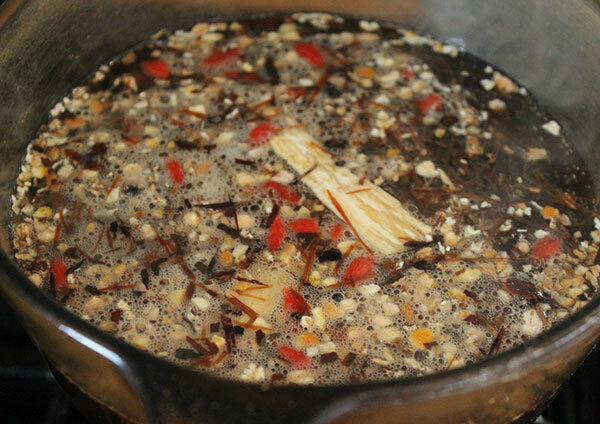 Creating a spiced nut milk from the tea base. Then blending in various superfoods. Add all ingredients to a little over a quart of boiling water and simmer (or decoct) on low heat for 20-30 minutes. Strain the tea and allow it to cool before making the nut milk. The tea can also be made ahead of time and stored in the fridge. 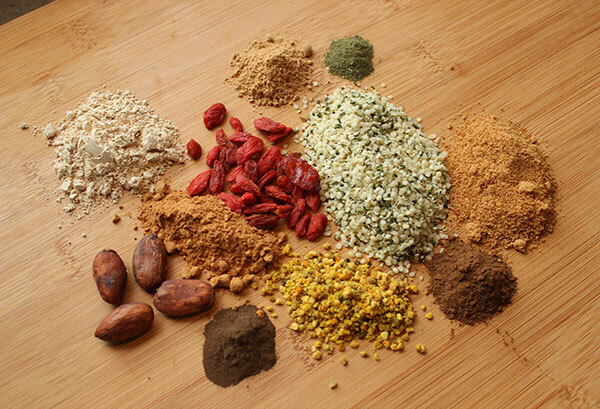 Blend a quart of herbal tea with above ingredients in a high speed blender or NutriBullet until smooth. Add the above ingredients into your nut milk. 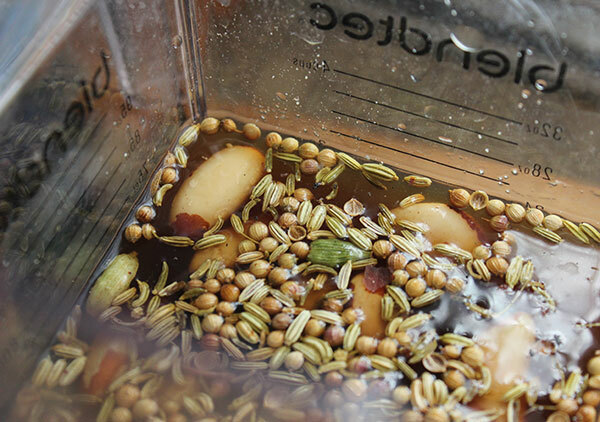 Place in a jar in the fridge for several hours or overnight and serve chilled as it will continue to thicken. Provides approximately two 8oz servings. 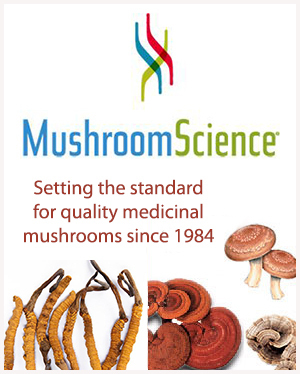 Depending on your personal taste buds, you might want to add more sweetener and less of the some of the stronger flavored superfoods, like maca, shilajit or bitter medicinal mushrooms, like reishi. 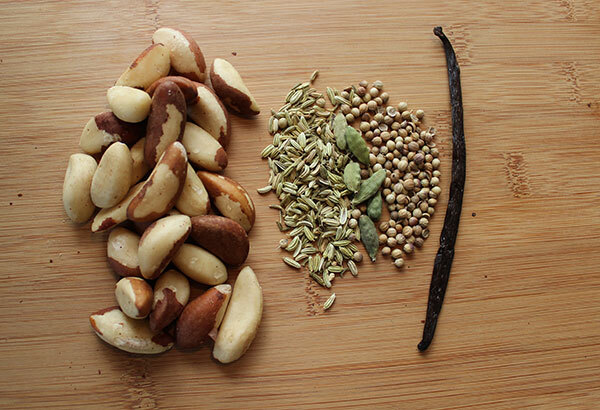 Over time it is fun to experiment with different herbs and spices as well as nuts and seeds when making your nut milk. Instead of making the herbal tea brew, it is also possible to substitute pre-made tonics like Dragon Herbs Longevity Tea or Imperial Tonics powder that also includes many of the herbs we use in this shake recipe. 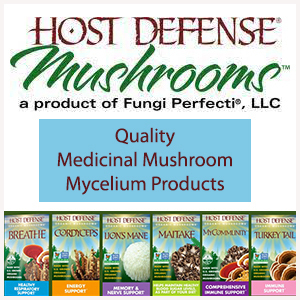 For more information about the different ingredients used, visit the links at the bottom of this page. 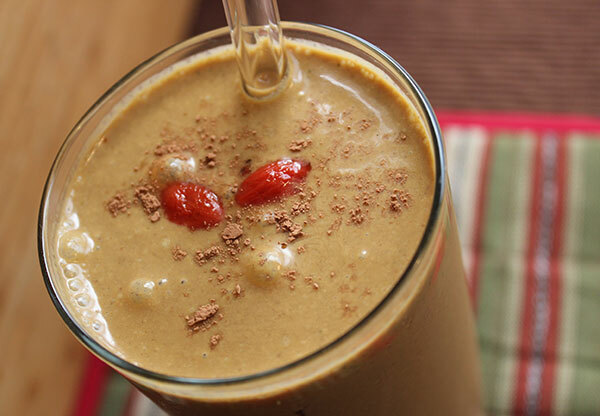 As we mentioned this shake recipe can be designed and formulated to your own personal needs and, although already somewhat high in protein content, can be taken one step further by adding an additional scoop of hemp seeds or protein powder to the recipe. Making your own high quality superfood protein shake recipe is a much better alternative to buying commercial store bought brands that are far less nutritious and potentially contain preservatives and a long list of unnatural ingredients. 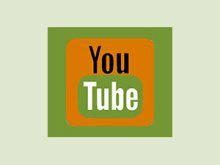 For more recipes ideas visit our raw vegan recipes page.